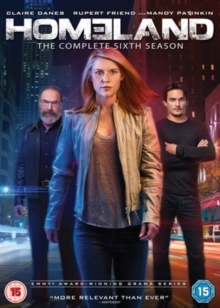 All 12 episodes from the sixth season of the critically acclaimed US drama centred around the life of former CIA agent Carrie Mathison (Claire Danes). Set several months after the end of the fifth season, Carrie returns home to work for a foundation supplying aid to Muslims living in the United States, just as the country elects a woman, Elizabeth Kean (Elizabeth Marvel), into the Oval Office. The episodes are: 'Fair Game', 'The Man in the Basement', 'The Covenant', 'A Flash of Light', 'Casus Belli', 'The Return', 'Imminent Risk', 'Alt. Truth', 'Sock Puppets', 'The Flag House', 'R for Romeo' and 'America First'.